“Canon ATSP challenges our technicians to be technologically savvy. Additionally, it enhances their troubleshooting ability to solve unknown problems; hence providing exceptional service to our customers,” said Steve Kennemer, Director of Service for Datamax Texas. To qualify, dealerships must have 75 percent of their service representatives certified within the program as of January 1, 2018. 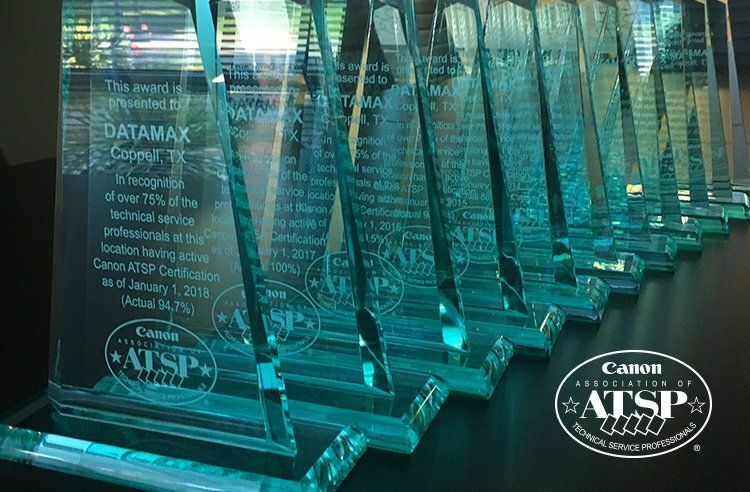 The Coppell office had more than 90 percent of its technicians ATSP certified. The ATSP program consists of six core exams, with several modules included with each exam, along with an equipment-specific test. The job function-based exams are designed to measure both the knowledge and the demonstration of the skills that are required in real-world settings for a support professional against a set of standards for competency and performance. As a result of our longstanding and unmatched commitment to training and expertise, for the last six months, 92.2 % of Datamax Service Calls were resolved on the first visit. For more about Datamax and how we strive to Create Raving Fans every day, please visit us here.